Marines blow a hole in a Saddam Hussein statue in Baghdad. BAGHDAD, Iraq (CNN) -- During their second day in the Iraqi capital Thursday, the 1st Battalion, 7th U.S. Marines, searched one of Saddam Hussein's presidential palaces hit by a bunker-busting bomb. The Marines were looking for clues to the whereabouts of regime leaders or weapons of mass destruction, CNN's Martin Savidge reported. Much of the palace was still intact, despite the bombing, and appeared to be "something out of Walt Disney World," as Savidge phrased it. The Marines planned to detonate any safes or vaults found in the building as part of their search for sensitive documents. After touring the palace, Savidge said the crystal chandeliers were still hanging from the ceilings and the opulent furniture remained intact. A white, baby grand piano was destroyed and sat collapsed on its side. The bombed palace's manicured landscaping and exterior facade hid the damage below. Savidge noted that several of the rooms appeared to be for teenagers and children, with all the modern conveniences that most Iraqis don't have. The "bunker buster" -- a GBU-28/37 Penetrator, 4,400-pound precision bomb -- has a hardened warhead designed to penetrate concrete objects like underground bunkers. Later in the day, the Marines planned to revisit the home of Deputy Prime Minister Tariq Aziz. They entered his home Wednesday and found evidence that he had left only recently -- with blankets draped over the furniture. Aziz, one of the Iraqi leader's longest-serving and most loyal aides, has been the primary face of the regime on the international stage. 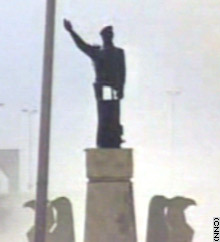 The Marines Thursday morning placed explosives at the base of the Saddam statue near the palace, after an M1A1 Abrams tank was unsuccessful in bringing the statue down. The explosives went off around 11:40 a.m. (3:40 a.m. ET), but only blew a hole in the middle of the 25-foot statue. The decision to remove the relic came after civilians said they would not leave the area until it was removed. The Marines arrived Wednesday in Baghdad and immediately set up a base at Baghdad University after battling enemy fire. The firefight happened just moments after passing hundreds of cheering Iraqis along the street, Savidge reported. In an intense half-hour battle, Marines returned small arms fire and knocked out several pickup trucks mounted with heavy weaponry. The battle ended when the Marines hit an ammunition cache, which erupted in a crescendo of explosions. There were no U.S. casualties during the encounter, Savidge reported.